A woodcutter never knows what excitement and danger he might run into. Just ask Pierre Logback, in the newest series from Pro Se Productions’ YoungPulp! imprint. Author John R. Rose creates a fascinating new fantasy world in THE ADVENTURES OF PIERRE LOGBACK: THE GREAT REINDEER RACE. While working as a woodcutter for the local village, Pierre meets a polar bear who communicates with him mentally. The bear, Al Yak-am, is from North Pole City located in Kris Kringle’s Kingdom in the far North. After the bear has gone, Pierre discovers a ruby pendant that he is sure the bear inadvertently left behind. He puts the pendant around his neck and goes to work. He feels the flow of energy from the bauble and finishes up a week’s work in a few hours. Then he starts out following the polar bear toward the North Pole. This begins a journey that will take the heroic woodcutter to strange new lands and introduce him to awesome new friends and horrifying enemies. From Claw, Thundergod of the Forest, to Jonalee, a young girl in peril, to the kidnapper King Golden Rod to even St. Nicholas himself. THE ADVENTURES OF PIERRE LOGBACK: THE GREAT REINDEER RACE by John R. Rose is the first volume in a series that will take readers of all ages on adventures that seem both familiar and are like nothing they’ve ever read! From YoungPulp! and Pro Se Productions. Aimed at introducing younger audiences to the style of Pulp Fiction while providing them with engaging tales, YoungPulp! features stories from all genres written both appropriately and intelligently for Young Readers to discover, enjoy, and explore. Written with intelligence and style that adults can appreciate as well, YoungPulp! aims to add to the growing numbers of GenreFiction and New Pulp Fans with tales that excite and appeal to pre teen and adolescent readers. 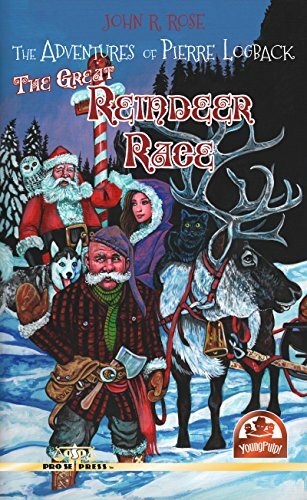 With a wonderful cover by Larry Nadolsky and logo design and print formatting by Marzia Marina and Antonino Lo Iacono, THE ADVENTURES OF PIERRE LOGBACK: THE GREAT REINDEER RACE is available now at Amazon at https://www.amazon.com/dp/1548900400/ref=sr_1_2?ie=UTF8&qid=1500390563&sr=8-2&keywords=pierre+logback and Pro Se’s own store at www.prose-press.com for 10.00. This first in a new Young Reader series is also available as an Ebook, designed and formatted by Lo Iacono and Marina for only $2.99 for the Kindle at https://www.amazon.com/dp/1548900400/ref=sr_1_2?ie=UTF8&qid=1500390563&sr=8-2&keywords=pierre+logback . This title is also a part of Kindle Unlimited, making it free for members of KU.